Al Ewing has been steadily building his profile at Marvel Comics over the last few years with exceptional runs on Mighty Avengers and Loki: Agent Of Asgard, and the publisher has given the writer a big push with the “All-New, All-Different Marvel” relaunch. Of the three books Ewing is currently writing, The Ultimates has quickly stood out as the most engaging read, showing more creative ambition than his work on Contest Of Champions (a comic-book tie-in to a mobile fighting game) and New Avengers. The first issue of The Ultimates created a new concept for a title that used to spotlight the premier superhero team of Marvel’s out-of-commission Ultimate Universe, with Ewing assembling a new group of heroes to solve “the ultimate problems.” Their first mission? 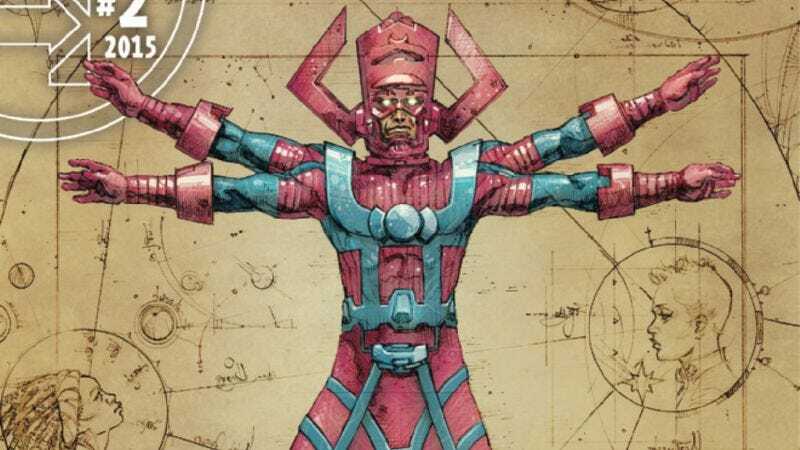 Figuring out how to stop the world-eating threat of Galactus, a huge endeavor that cements the title’s expansive scope. The Ultimates marks the Marvel Comics debut of artist Kenneth Rocafort, who was grossly underutilized at DC Comics on books like Red Hood And The Outlaws, Superman, and Teen Titans. His artwork with colorist Dan Brown matches the ambition of Ewing’s story, and this preview of next week’s The Ultimates #2 spotlights the intricate linework and bold layouts that make Rocafort such an exciting superhero artist. His sharp understanding of sci-fi design elements is a great fit for a story delving into the history of an alien world-eater, but he also does strong work with the tribal elements of the Black Panther two-page spread, which has a very different look and feel from the rest of the tech-heavy pages. It’s a beautiful book, and the combination of Ewing’s writing with Rocafort and Brown’s art makes The Ultimates a remarkable reinvention.